The sporangia most easily recognized in the Rhynie chert are those of Aglaophyton (former Rhynia major). These are often seen intact and full or split and empty. Lengthwise splitting is usually regarded as the only way of spore release [1,2]. This is not consistent with the observation that sporangia are often partly or completely empty but not split. One could argue that the split is there but not seen on the cut face. There is, however, a quite different explanation for the missing spores: The sporangia are often invaded by spore eaters entering through holes gnawed into the wall (Figs.1,2,3). Although the creatures themselves have not yet been seen, the chewed-up spores and partly eaten-off inner layers of the sporangia serve as evidence for their (transient) presence. 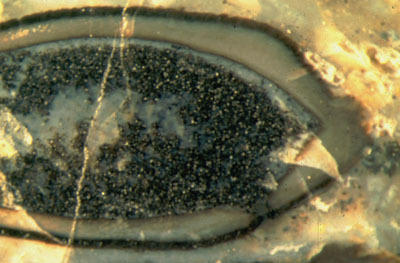 Fig.1: Section of Aglaophyton sporangium with hole in the wall and chewed-up spores. Fig. 2: Lengthwise section of Aglaophyton sporangium with hole in the wall and chewed-up spores. Fig. 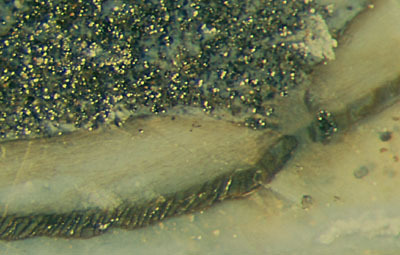 3 (far right): Detail of Fig.2. The holes in the sporangia were apparently not noticed before as they are not mentioned in the literature. 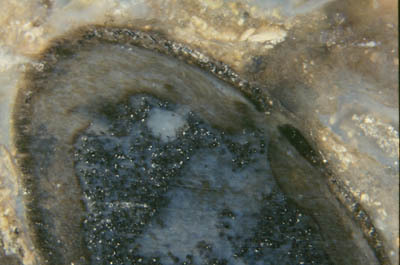 Judging from the available fossil material and taking into account that the chance of being cut incidentally is much smaller for a small hole than for a lengthwise split, it can be concluded that sporangia with holes and with spores eaten up and dragged out are about as common in the Rhynie chert as split sporangia with spores fallen out. (3rd Chert Meeting, Chemnitz 2004.) There remains the challenge to find the elusive creature responsible for the damage done to Aglaophyton, the most common plant in the Rhynie chert. Chert, Bot. J. Linn. Soc. 93(1986), 173-204. Dianne Edwards : private communication (2003).